Let us use the Rays as an example, because, hell, if the Rays didn’t want to be used as the poster team for hemorrhaging salary with no clear goal other than to shovel cash into its ownership’s maw, maybe they shouldn’t have so conspicuously nuked a roster that was five games out of a playoff spot. $45 million in reported annual revenue sharing from MLB’s higher-spending teams. $35 million in the final year of its local TV deal. A new, 15-year deal is close to being signed, with the average payout rising to $82 million annually over the length of the deal, beginning in 2019. $50 million—at minimum—in a lump sum from the sale of MLB’s digital media company BAMTeach. That’s about $130 million in revenue, this season and in future seasons, even before they start playing baseball. And what have the Rays done with all that guaranteed cash? They traded away Evan Longoria, the face of the franchise. They traded Steven Souza, the team MVP last season. They DFAed and traded Corey Dickerson, an all-star last year. They traded Jake Odorizzi. They let Logan Morrison walk. They’ve turned over half their 40-man roster since the end of last year, and they no longer have seven of 2017's best 12 players by WAR. This is not a team that’s trying to win. Which, under certain circumstances and for isolated periods of time, is fine. But this is also not a team that’s trying to spend any money. That, from the point of view of the Players’ Union, is not OK. 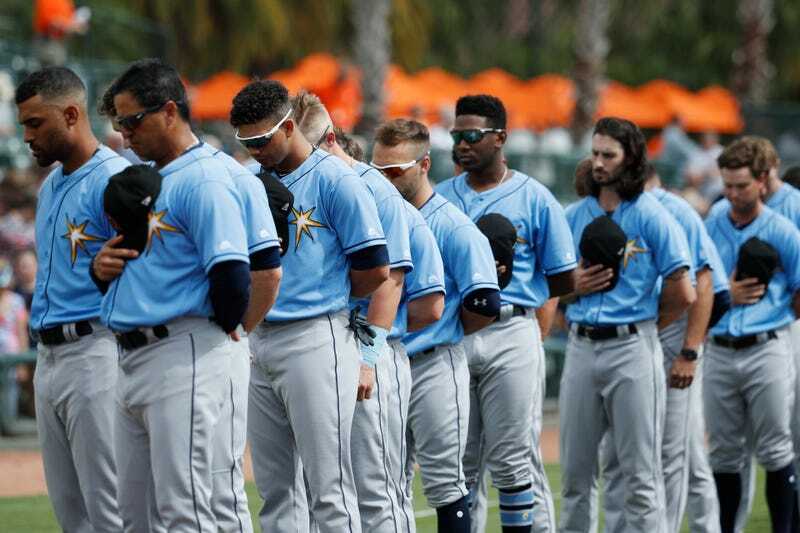 The Tampa Bay Times reports that on Friday, the MLBPA filed a formal grievance against the Rays, the Marlins, the Pirates, and the A’s, accusing the clubs of failing to comply with MLB’s rules regarding the spending of revenue-sharing proceeds. According to the CBA, teams are required to spend that money “to improve its performance on the field”—though there is wiggle room for spending it at the minor league and scouting level to eventually improve the big-league club. MLB, unsurprisingly, thinks there’s no problem here. The grievance comes a month after the MLBPA “raised concerns” with Commissioner Rob Manfred about the Marlins and Pirates stripping their rosters and slicing payroll. The last time a grievance like this was filed, in 2010, MLB leaned on the Marlins, who agreed to raise payroll for a brief time and to share financials with the union. MLB seems inclined to fight this one, so it will likely head to an arbitrator. In the meanwhile, Tampa’s more expensive players aren’t exactly feeling secure, even though spring training is underway.